Xabi Alonso called time on his career after helping Bayern to their record fifth consecutive Bundesliga title - his third on the bounce. 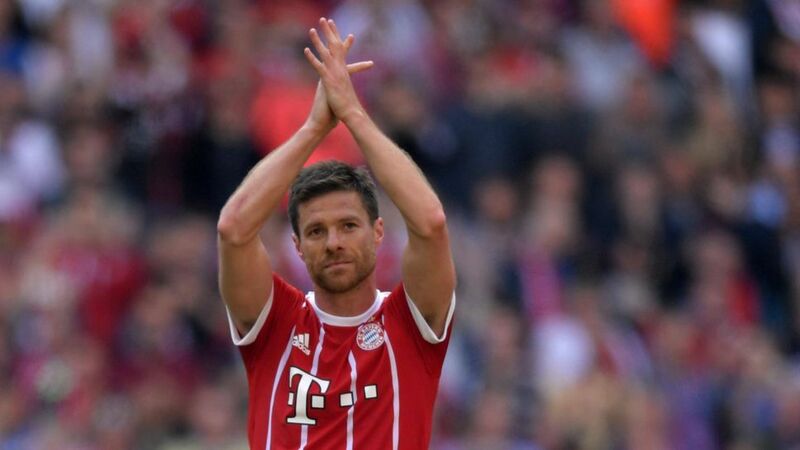 A visibly emotional Xabi Alonso pulled the curtain down on an illustrious career, joining Bayern Munich captain Philipp Lahm in retiring after the final-day 4-1 win over Freiburg. The 35-year-old Spaniard won three Bundesliga titles, a DFB Cup and and DFL Supercup in a glittering three-year stay in Bavaria, and glistened till the last, setting up Arjen Robben for the opening goal at the Allianz Arena with a ranging pass few players in world football could pull off. bundesliga.com: Xabi Alonso, how does it feel to have played your last game? Xabi Alonso: It is a mixture of many feelings: melancholy, emotion, sadness, joy and nostalgia. Even at the very last moment football can surprise you. I have continued to have new experiences throughout my career. I’m very satisfied to bow out at this level. Watch: Alonso: "Many mixed emotions"
bundesliga.com: Did you shed any tears? Alonso: I did on the inside. I did not let it show as I contained my emotions – but there was a lot to contain. From the very first moment you could see and feel the fans’ desire to enjoy the moment. They were very affectionate towards me. Part of me will belong to this club forever. bundesliga.com: Did you think about the fact that this was your last match whilst you were playing it? Alonso: I was thinking of everything. There were moments when I was reflecting on my career and other times where I was more focused on the game. bundesliga.com: What did coach Carlo Ancelotti and your teammates say to you? Alonso: They were all very happy for Philipp Lahm and myself because we have brought the curtain down on important careers. We all enjoyed the process together. It was beautiful. bundesliga.com: How does Bayern’s future will look without you and Lahm? Alonso: The future will be bright. We leave behind some great players within a significant project so they will continue to enjoy success. I don’t think they’ll have any problems because Bayern have big players who will remain. They have great experience but with a blend of youth so I’m sure they will fight on every front next season. That is part of the cycle of life. When some leave others arrive, and everyone understands that. bundesliga.com: What memories will you take with you from Munich? Alonso: Many experiences, many people that made me feel welcome from the first moment. People that let you know the gravity of playing for Bayern Munich. I think you find people like this at great clubs – it was true of Liverpool and Real Madrid, too. From the first moment I understood that you have to sacrifice yourself for the club, and when you do that they give you everything. That is something I will always remember. bundesliga.com: What will you miss the most? Alonso: At the moment I haven’t had time to miss anything! But surely I will miss things in the future because this has been a very important stage of my life and it will be very difficult to fill that gap. But life goes on and there will be new challenges for me, and now is the time to try them out. bundesliga.com: How do you want to be remembered? Alonso: I tried to do things my way and enjoy it, but it’s difficult to know what the public's perception is. I hope they respect me and if they remember me fondly I’ll be happy with that. bundesliga.com: Did the Bundesliga meet your expectations? Alonso: Yes, totally. Both the Bundesliga and Bayern. We all have an image of what the clubs are like but until you live it you cannot fully appreciate it.